Luxemburg reveals the counter-revolutionary nature and consequences of the Bolsheviks' nationalist policy of the "right of self-determination of peoples". 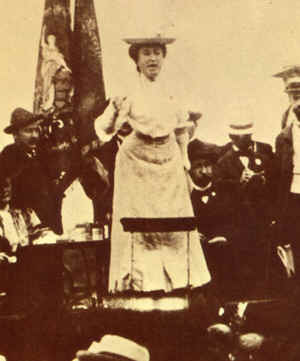 Originally published as Chapter II of the pamphlet The Russian Revolution, which was constituted out of notes prepared by Rosa Luxemburg in prison in 1918, and published posthumously. This version is taken from "The National Question - Selected Writings by Rosa Luxemburg", Ed. H.B. Davis, Monthly Review Press, 1976, USA. The Bolsheviks are in part responsible for the fact that the military defeat was transformed into the collapse and breakdown of Russia. Moreover, the Bolsheviks themselves have, to a great extent, sharpened the objective difficulties of this situation by a slogan which they placed in the foreground of their policies: the so-called right of self-determination of peoples, or - something which was really implicit in this slogan - the slogan of the disintegration of Russia. The formula of the right of the various nationalities of the Russian Empire to determine their fate independently, "even to the point of the right of governmental separation from Russia," was proclaimed again with doctrinaire obstinacy as a special battle cry of Lenin and his comrades, during their opposition against Miliukovist, and then Kerenskyan imperialism. It also constituted the axis of their inner policy after the October Revolution. And it constituted the entire platform of the Bolsheviks at Brest-Litovsk, all they had to oppose to the display of force by German imperialism. One is immediately struck with the obstinacy and rigid consistency with which Lenin and his comrades stuck to this slogan, a slogan which is in sharp contradiction to their other wise outspoken centralism in politics as well as to the attitude they have assumed toward other democratic principles. While they showed a quite cool contempt for the Constitutuent Assembly, universal suffrage, freedom of press and assembly, in short, for the whole apparatus of the basic democratic liberties of the people which, taken all together, constituted the "right of self-determination" inside Russia, they treated the right of self-determination of peoples as a jewel of democratic policy for the sake of which all practical considerations of real criticism had to be stilled. While they did not permit themselves to be imposed upon in the slightest by the plebiscite for the Constituent Assembly in Russia, a plebiscite on the basis of the most democratic suffrage in the world, carried out in the full freedom of a popular republic, and while they simply declared this plebiscite null and void on the basis of a very sober, critical evaluation of its results, still at Brest they championed the "popular vote" of the foreign nationalities of Russia on the question of which land they wanted to belong to, as the true palladium of all freedom and democracy, the unadulterated quintessence of the will of the people, and as the court of last resort in questions of the political fate of nations. The contradiction that is so obvious here is all the harder to understand since the democratic forms of political life in each land, as we shall see, actually involve the most valuable and even indispensable foundations of socialist policy, whereas the famous "right of self-determination of nations" is nothing but hollow, bourgeois phraseology and humbug. calculated that there was no surer method of binding the many foreign peoples within the Russian Empire to the cause of the revolution, to the cause of the socialist proletariat, than that of offering them, in the name of the revolution and of socialism, the most extreme and most unlimited freedom to determine their own fate. This was analogous to the policy of the Bolsheviks toward the Russian peasants, whose land hunger was satisfied by the slogan of direct seizure of the noble estates and who were supposed to be bound thereby to the banner of the revolution and the proletarian government. In both cases, unfortunately, the calculation was entirely wrong. While Lenin and his comrades clearly expected that, as champions of national freedom even to the extent of "separation," they would turn Finland, the Ukraine, Poland, Lithuania, the Baltic countries, the Caucasus, etc., into so many faithful allies of the Russian Revolution, we have witnessed the opposite spectacle. One after another, these "nations" used the freshly granted freedom to ally themselves with German imperialism against the Russian Revolution as its mortal enemy, and, under German protection, to carry the banner of counter-revolution into Russia itself. The little game with the Ukraine at Brest, which caused a decisive turn of affairs in those negotiations and brought about the entire inner and outer political situation at present prevailing for the Bolsheviks, is a perfect case in point. The conduct of Finland, Poland, Lithuania, the Baltic lands, the nations of the Caucasus, shows most convincingly that we are dealing here not with an exceptional case, but with a typical phenomenon. To be sure, in all these cases, it was really not the "people" who engaged in these reactionary policies, but only the bourgeois and petit bourgeois classes, who - in sharpest opposition to their own proletarian masses - perverted the "national right of self-determination" into an instrument of their counter-revolutionary class policies. But - and here we come to the very heart of the question - it is in this that the utopian, petit bourgeois character of this nationalistic slogan resides: that in the midst of the crude realities of class society, especially when class antagonisms are sharpened to the uttermost, it is simply converted into a means of bourgeois class rule. The Bolsheviks were to be taught, to their own great hurt and that of the revolution, that under the rule of capitalism there is no self-determination of peoples, that in a class society each class of the nation strives to "determine itself" in a different fashion; and that, for the bourgeois classes, the standpoint of national freedom is fully subordinated to that of class rule. The Finnish bourgeoisie, like the Ukrainian petite bourgeoisie, was unanimous in preferring the violent rule of Germany to national freedom, if the latter should be bound up with Bolshevism. The hope of transforming these actual class relationships somehow into their opposite through "plebiscites," on which everything turned at Brest, and of getting a majority vote for union with the Russian Revolution by depending on the revolutionary masses if it was seriously meant by Lenin and Trotsky-represented an incomprehensible degree of optimism. And if it was only meant as a tactical flourish in the duel with the German politics of force, then it represented dangerous playing with fire. Even without German military occupation, the famous "popular plebiscite," supposing that it had come to that in the border states, would have yielded a result, in all probability, which would have given the Bolsheviks little cause for rejoicing; for we must take into consideration the psychology of the peasant masses and of great sections of still indifferent proletarians, as well as the reactionary tendency of the petite bourgeoisie, and the thousand ways in which the bourgeoisie could have influenced the vote. Indeed, it can be taken as an unbreakable rule in these matters of plebiscites on the national question, that the ruling class will either know how to prevent them where it doesn't suit their purpose, or, where they somehow occur, will know how to influence their results by all sorts of means, big and little, the same means which make it impossible to introduce socialism by a popular vote. The mere fact that the question of national aspirations and tendencies toward separation were injected at all into the midst of the revolutionary struggle, and were even pushed into the foreground and made into the shibboleth of socialist and revolutionary policy as a result of the Brest peace, has served to bring the greatest confusion into socialist ranks and has actually destroyed the position of the proletariat in the border countries. Or take the Ukraine. At the beginning of the century, before the tomfoolery of "Ukrainian nationalism" with its silver rubles and its "Universals" and Lenin's hobby of an "independent Ukraine" had been invented, the Ukraine was the stronghold of the Russian revolutionary movement. From there, from Rostov, from Odessa, from the Donetz region, flowed out the first lava streams of the revolution (as early is 1902-1904), which kindled all South Russia into a sea of flame, thereby preparing the uprising of 1905. The same thing was repeated in the present revolution, in which thc South Russian proletariat supplies the elite troops of the proletarian phalanx. Poland and the Baltic lands have been, since 1905, the mightiest and most dependable hearths of revolution, and in them the socialist proletariat has played aii outstanding role. How does it happen then, that in all these lands the counter-revolution suddenly triumphs? The nationalist movement, just because it tore the proletariat loose from Russia, crippled it thereby, and delivered it into the hands of the bourgeoisie of the border countries. Instead of acting in the same spirit of genuine, international, class policy which they represented in other matters, instead of working for the most compact union of the revolutionary forces throughout the area of the Empire, instead of defending tooth and nail the integrity of the Russian Empire as an area of revolution and opposing to all forms of separatism the solidarity and inseparability of the proletarians in all lands within the sphere of the Russian Revolution as the highest command of politics, the Bolsheviks, by their hollow nationalistic phraseology concerning the "right of self-determination to the point of separation," have accomplished quite the contrary and supplied the bourgeoisie in all border states with the finest, the most desirable pretext, the very banner of the counter-revolutionary efforts. Instead of warning the proletariat in the border countries against all forms of separatism as mere bourgeois traps, they did nothing but confuse the masses in all the border countries by their slogan and delivered them up to the demagogy of the bourgeois classes. By this nationalistic demand they brought on the disintegration of Russia itself, pressed into the enemy's hand the knife which it was to thrust into the heart of the Russian Revolution. To be sure, without the help of German imperialism, without "the German rifle butts in German fists," as Kautsky's Neue Zeit put it, the Lubinskys and other little scoundrels of the Ukraine, the Erichs and Mannerheims of Finland, and the Baltic barons would never have gotten the better of the socialist masses of the workers in their respective lands. But national separatism was the Trojan horse inside which the German "comrades," bayonets in hand, made their entrance into all those lands. The real class antagonisms and relations of military force brought about German intervention. But the Bolsheviks provided the ideology which masked this campaign of counter-revolution; they strengthened the position of the bourgeoisie and weakened that of the proletariat. The best proof is the Ukraine, which was to play such an unhappy role in the outcome of the Russian Revolution. Ukrainian nationalism in Russia was something quite different from, let us say, Czech, Polish, or Finnish nationalism, in that the former was a mere whim, a folly of a few dozen petit bourgeois intellectuals, without the slightest roots in the economic, political, or psychological relationships of the country; it was without any historical tradition, since the Ukraine never formed a nation or government, was without any national culture, except for the reactionary romantic poems of Shevschenko. It is exactly as if, one fine day, the people living in the Wasserkante should want to found a new Low-German [Plattdeutsche] nation and government! And this ridiculous pose of a few university professors and students was inflated into a political force by Lenin and his comrades through their doctrinaire agitation concerning the "right of self-determination including, etc." To what was at first a mere farce they lent such importance that the farce became a matter of the most deadly seriousness - not as a serious national movement for which, afterward as before, there are no roots at all, but as a shingle and rallying flag of counter-revolution! At Brest, out of this addled egg crept thc German bayonets. There are times when such phrases have a very real meaning in the history of class struggles. It is the unhappy lot of socialism that in this World War it was destined to supply the ideological screens for counter-revolutionary policy. At the outbreak of the war, German Social Democracy hastened to deck the predatory expedition of German imperialism with an ideological shield from the lumber room of Marxism bv declaring it to be a liberating expedition against Russian Tsarism such as our old teachers [Marx and Engels] had longed for. And to the lot of the Bolsheviks, who were the very antipodes of our government socialists, did it fall to supply grist for the mill of counter-revolution with their phrases about self-determination of peoples; and thereby to supply an ideology, not alone for the strangling of the Russian Revolution itself, but even for the planned counter-revolutionary settlement of the entire World War. We have good reason to examine very carefully the policies of the Bolsheviks in this regard. The "right of self-determination of nations," coupled with the League of Nations and disarmament by the grace of President Wilson, constitute the battle cry under which the coming reckoning of international socialism with the bourgeoisie is to be settled. It is obvious that the phrases concerning self-determination and the entire nationalist movement, which at present constitute the greatest danger for international socialism, have experienced an extraordinary strengthening from the Russian Revolution and the Brest negotiations. We shall yet have to go into this platform thoroughly. The tragic fate of these phrases in the Russian Revolution, on the thorns of which the Bolsheviks were themselves destined to be caught and bloodily scratched, must serve the international proletariat as a warning and lesson. And from all this there followed the dictatorship of Germany from the time of the Brest treaty to the time of the "supplementary treaty." The two hundred expiatory sacrifices in Moscow. From this situation arose the terror and the suppression of democracy. 1. This selection is published as Chapter II of the pamphlet, The Russian Revolution, which was constituted out of notes prepared by Rosa Luxemburg in prison in 1918, and published posthumously. There is more than one version of certain passages. We have followed, for the most part, the text of the German edition edited by Paul Levi (Frankfurt-am-Main: 1922), as corrected by Felix Weillsee Grunberg's Archiv fur die Geschichte des Sozialismus und der Arbeiterbewegung (1928), pp. 285-98. 2. The manuscript speaks of Karbowentzen, which may be a Germanization of the Russian word for "silver ruble," probably referring to a special Ukrainian coinage, and of "Universals", the name applied to certain manifestoes or declarations of the Ukrainian Rada (National Assembly). 3. Six weeks after the signing of the Brest-Litovsk treaty, there was a codicil or supplement signed. The "two hundred expiatory sacrifices" may refer to the execution of persons charged with complicity in the assassination of the German ambassador, Count von Mirbach, shot by terrorists of the Socialist Revolutionary Party.